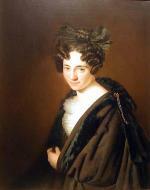 Anton Einsle (1801 Vienna - 1871 ibidem) was a very significant Austrian portrait painter of the 19th century. At the age of 13 he began studying at the Vienna Academy and painted his first works on commission at 16. 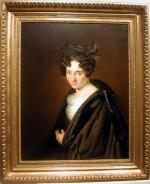 His first portraits in oil and miniatures are known to appear in 1827. His works were represented at all great exhibitions in Vienna from 1830 on. Einsle worked in Prague and Budapest for a few years. He soon became a favourite portrait painter of high aristocracy and royals and was an official portraitist of Kaiser Franz Josef I. Einsle received the title of Royal Painter in 1838. Works by Einsle are represented in many museums in Austria and abroad, also in private collections, for example, by Gianni Versace .Works by Einsle arrive at auctions today five-figure euro amounts. Einsle received the title of Royal Painter in 1838. Since then the best paintings of his bears a inscription like in ours: K.K. Hofmaler A. Einsle (what means Kaiser-Königlicher (= imperial-royal) Hofmaler (=painter) A. Einsle). Works of Anton Einsle achieve sometimes very high prices (see last additional image). Inscription: signed and dated 1831 upper right. Technique: oil on canvas. Original perion frame.